Dungannon Swifts manager Rodney McAree signed a new contract ahead of the club's 2-0 win over Carrick Rangers. 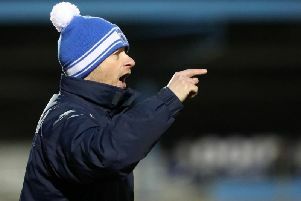 Dungannon boss Rodney McAree celebrated the signing of his new contract with three points at home to relegation threatened, Carrick Rangers and he was delighted to get the deal done and put an end to speculation of a summer exit. “I’ve signed the new contract and I’m happy to get everything sorted,” said the Swifts boss. “Everyone was aware of the speculation, but I believe that we can do well at Dungannon - we can push on and finish higher up the table. Reflecting on the comfortable win over Carrick, McAree added: “It was a good win for us and I’m very happy. Without meaning to sound arrogant, I thought we were comfortable. We created a few chances in the first half and Harry Doherty made an absolutely wonderful save from Paul McElroy. How he kept it out I don’t know. “At half-time we told the players to keep plugging away and to keep doing what we had been doing. We just needed to turn the screw that wee bit more in the second half.